The A' Creative Legacy, Retro and Evergreen Design Award is a freestyle design competition open only to realized projects. Unlike other competition categories, the Retro Design Award has a time-frame restriction: Entries must be made at least 10 years ago or they shall be older; new designs cannot be submitted. This category is especially created for senior designers and companies with a strong design tradition and history. The competition is open to both designers and manufacturers. The A' Design Award for Creative Legacy, Retro and Evergreen is not just an award, it is the indicator of quality and perfection in design, the award is recognized worldwide and takes the attention of design oriented companies, professionals and interest groups. Having the A' Award attracts the eyes of design oriented press worldwide, winners will be able to find better and higher profile publication possibilities. 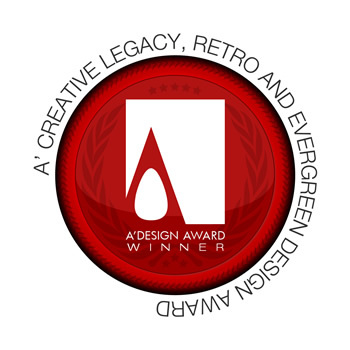 The winners of the A' Creative Legacy, Retro and Evergreen Design Award are provided extensive and exclusive marketing and communication services to promote the success of winning the A' Award. When submitting to the Creative Legacy, Retro and Evergreen Design Competition keep in mind that your submission will be evaluated on multiple dimensions, your design will be judge together with its context; era of creation, available technologies of the time, and innovation based on time. Applicants should send high-resolution images of the design, together with a presentation. The best retro designs are considered for their degree of innovation, human factors, ease of implementation and realization, depthness of development, and overall public value generation, but all of these values will be evaluated considering the timeframe. Unlike some other design awards and competitions, you are not obliged to make any further fees for winning the retro design award and everything listed in the winners benefits will be provided free of charge. The Aim of the Creative Legacy, Retro and Evergreen Award is to attract the attention of mass media, magazines, and industry leads to your business by means of creating publicity and dissemination and also to separate you from the rest of the actors in the manufacturing industry and design sector by honoring your institution with a prestigious award. To be eligible for this award, your designs must be 15 years or older; i.e. new designs are not accepted, only retro / legacy design works are considered. Award winners will be able to use a title that matches their nomination category: Such as "Retro Design Award Winner".